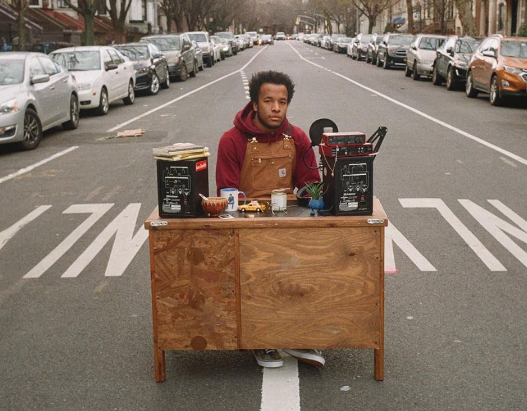 This week, Cautious Clay unveiled his brand new EP Table of Context. He took some time out to answer a few questions about the EP and when we can expect to see him in Australia. Scroll down to check out the EP below. Congrats on one year of Blood Type!! Did you do anything to celebrate its birthday? I played a show (laughs). I don't think so, I don't think I did, no. Across the past year, have you spent any time reflecting on the release? Yeah, a little bit. I just kind of think about, you know, what made it special and how it flowed together, so yeah for sure I do reflect on it. Though your music is obviously personal, so many fans find themselves connected to your words which must be pretty special for you. How important is that connection to you? It's everything. I think it's what makes the whole process fun, you know, like the creative process being such a vulnerable process, it's really incredible when people, real people, can connect to it. A lot has happened for you the last few years, has it felt like a whirlwind? Definitely, I could never have seen myself in this position, even just a year ago. With your upcoming release Table of Context, will that be a continuation of any of your previous releases or its own thing? Yeah so hopefully include 'Reasons' and 'Honest Enough', which are the singles from the project. Where did you spend time creating the EP? I spent a lot of time in Brooklyn in New York. I spent some time in LA. I think I spent the time travelling writing, I was writing a lot when I was travelling on tour too. One was Sweden, Stockholm. Was it a lengthy process putting Table of Context together? It was definitely an interesting one. It was hard to find the right songs, well not the right songs but the songs that fit the project the best. That was probably the most challenging part, kind of widdling down a lot of songs because there is just so much music. What song from it are you most excited for everyone to hear? Can we expect to see you in Australia sometime in the future? Definitely, in 2020, that is the plan!